Generally, anything with red bean or tau sar is not so popular in my family. I personally like it however, as I know it is healthy. I was so optimistic increased the volume make more Tau Sar Pau this time. The feedback from my family is that it is nice and healthy. But, they still prefer the runny and oozy Pumpkin Kaya. Please click here for Pumpkin Kaya Pau. I made my own homemade red bean paste. We have the full control of amount and quality of sugar and oil we added. After all, eating healthy is my motto. Please refer here for recipe. Combine water, yeast and sugar in a bowl of electric stand mixer. Let it sit for 2 – 3 minutes. Then add in the rest of the ingredients. Knead the dough until all come together, around 10 minutes with the dough hook attached. Cover the bowl with kitchen towel or cling wrap and let the dough rest for 60 minutes. Lightly dust the working surface with flour. Gently punch down the dough to deflate. Roll the dough to form a log. Cut and divide into 20 equal portion, approximately 43g per portion. 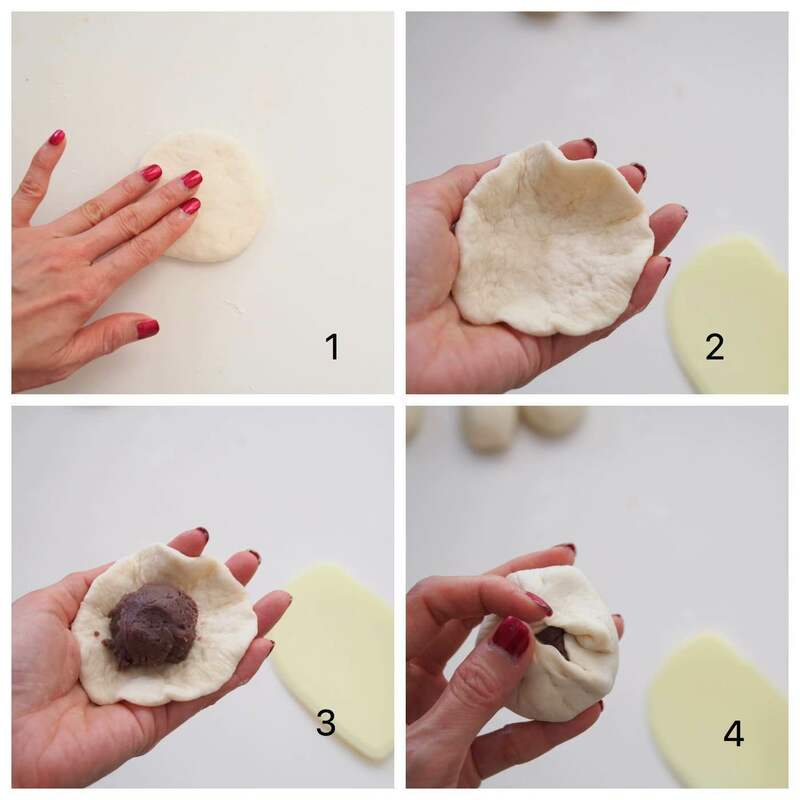 Shape each dough into a ball. Flatten the ball with your palm into a circle. Place about 1 tablespoon of red bean paste in the centre. Gather up the edges to seal and shape into round ball. Place the bun on the prepared parchment paper. 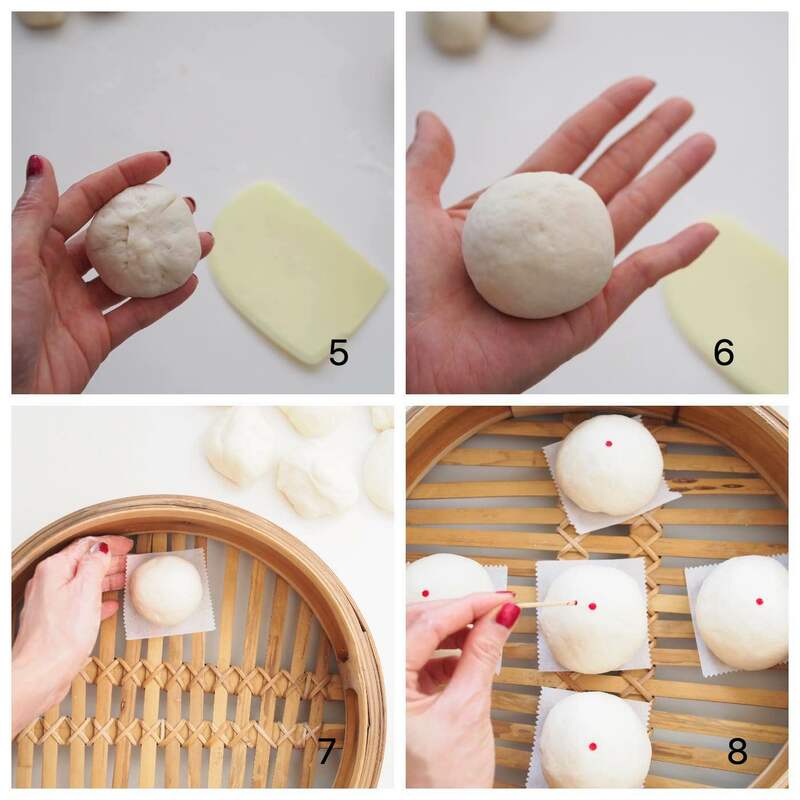 Spread the buns on the bamboo steamer about 1 inch apart as the dough will rise. Let the buns rise for another 15 to 20 minutes in semi warm area. Paint a red dot on top of each bun with tooth pith. Prepare the steamer, wrap the steamer cover with a clean cloth. This will prevent steamer water dropping on the bun, to get a smooth skin. Steam for 10 to 12 minutes over the medium heat. Once it’s done, open the cover slightly to release the heat for few minutes. Transfer the bamboo steamer away from the water and let it stand for another few minutes before removing the cover. With this, the buns will not shrink after cooling down. 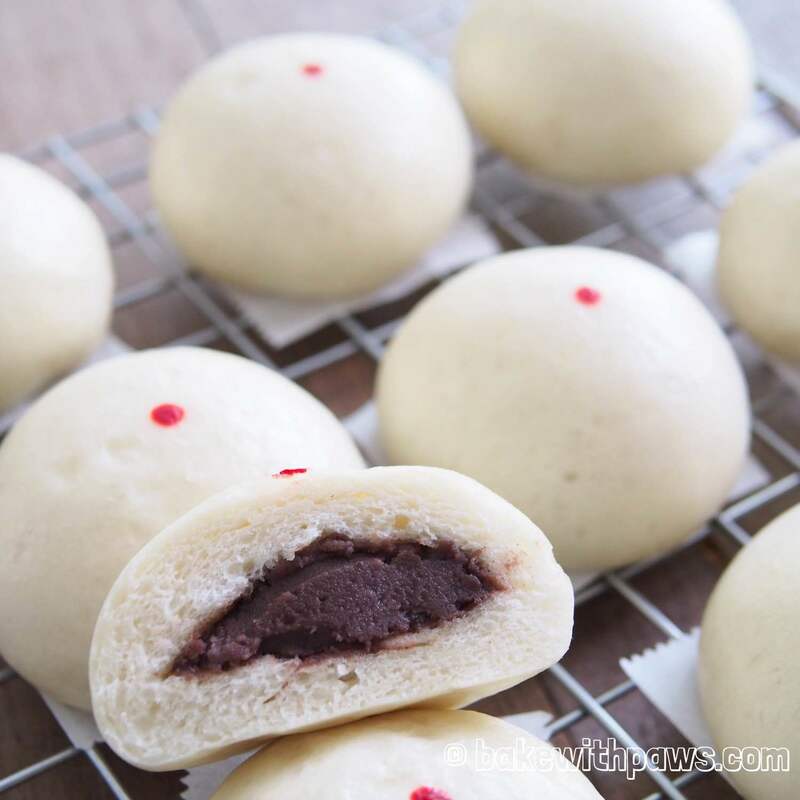 It is better to use the red bean paste that already made one day before and stored in the fridge as it is easy to handle.